Martyn Alcock modelled this adorable figurine. She is wearing a Mauve dress, mottled burgundy and green shawl and a brown hat. The figurine was issued in 1992 and ran until 1998. It has the Royal Albert Beatrix Potter back-stamp BP-6a. 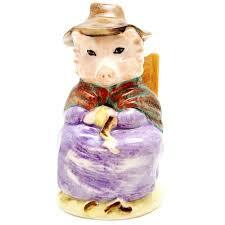 BEATRIX POTTER - Royal Albert *AND THIS PIG HAD NONE* 6a - Boxed Mint !